In the wake of the French Revolution, as attempts to restore political stability to France repeatedly failed, a group of concerned intellectuals identified a likely culprit: the prevalent sensationalist psychology, and especially the flimsy and fragmented self it produced. They proposed a vast, state-run pedagogical project to replace sensationalism with a new psychology that showcased an indivisible and actively willing self, or moi. As conceived and executed by Victor Cousin, a derivative philosopher but an academic entrepreneur of genius, this long-lived project singled out the male bourgeoisie for training in selfhood. Granting everyone a self in principle, Cousin and his disciples deemed workers and women incapable of the introspective finesse necessary to appropriate that self in practice. 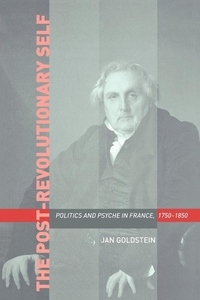 Beginning with a fresh consideration of the place of sensationalism in the Old Regime and the French Revolution, Jan Goldstein traces a post-Revolutionary politics of selfhood that reserved the Cousinian moi for the educated elite, outraged Catholics and consigned socially marginal groups to the ministrations of phrenology. Situating the Cousinian moi between the fragmented selves of eighteenth-century sensationalism and twentieth-century Freudianism, Goldstein suggests that the resolutely unitary self of the nineteenth century was only an interlude tailored to the needs of the post-Revolutionary bourgeois order.